To say that the larger Newtown area has a couple of pubs really does undersell it, where it often seems like there is a pub on every corner, and in some places there really is. With an overwhelming level of choice though it can be hard to find the right one to attend when you're looking for a night out. To aid a local in finding a new place, or a visitor picking where is best for them, here is a comprehensive list of the pubs and bars, and why to frequent them. Since this needs to be a rather long list, I am going to try to keep each description to a sentence. Kuletos - Begin a night here for sugary drinks, but abandon it when happy hour ends. Corridor - The nicest cocktail bar in Newtown with the prices to match. The Coopers Hotel - The balcony is better than the downstairs by far, and everyone knows it. 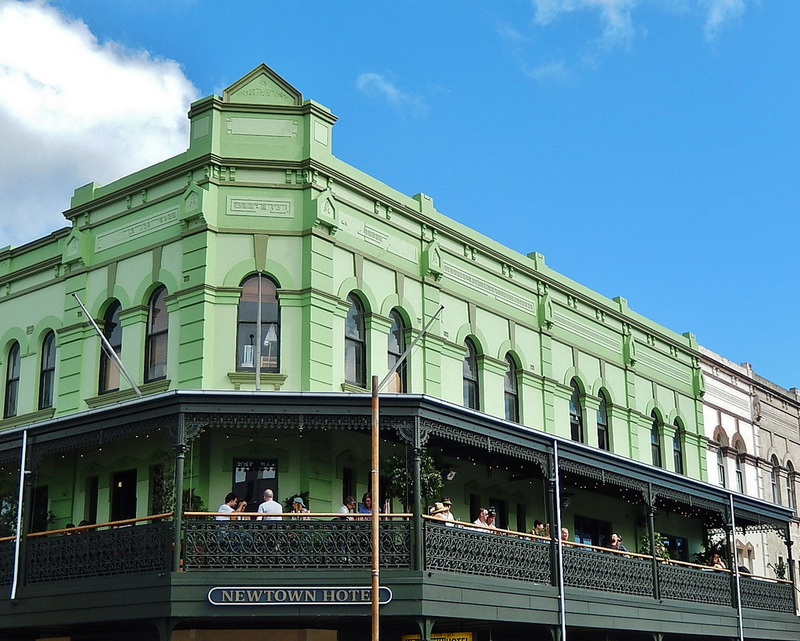 The Newtown Hotel - A modern update to an old, old pub, it features the novelty of wine on tap. Marlborough Hotel - A rougher pub but the new rooftop bar allows some spectacular views of the city. Mary's - Great cocktails if you never want to listen to what your companions are saying. The Hive Bar - This place is lovely and has great food and craft beers, and all the locals know this for their Friday nights. The Swanson Hotel - A gentrified pub still finding its new regulars, once named the Kurrajong. The Erskineville Hotel - Surprisingly pleasant for a pub nicknamed 'The Erko'. The Rose - A classy establishment with very nice patio seating. The Bank Hotel - Another revamp, and if you can find your way down to the courtyard, a really nice place to get a cocktail jug. Zanzibar - My friend once met Tim Freedman here and hasn't stopped talking about it since, but otherwise unremarkable. Sly Fox Hotel - You don't have to be a lesbian to go here, but it is a place of acceptance (and dancing). Hartsyard - They have delicious cocktails, but seriously book in here and try their poutine. Cittavino - A really pleasant place to start an evening. The Green Room Lounge - Too many martinis give me a blurred impression, but my parents tell me the dancing here was amazingly fun. The Duke of Edinburgh - This is a traditional Sydney pub with nothing special about it. Queen Victoria Hotel - Matches its sister pub across the road, but without the nice beer garden. Court House Hotel - Great location and setup if you don't mind being overcrowded, even on weeknights. Kelly's - A famous place to end an evening as they are the last to close, and you should expect everything that implies from the clientelle.